TELL ME YOUR NAME isn't at all like CALL ME BY YOUR NAME!!! We have a trailer for “Tell Me Your Name” below. So the basic story seems to go like this. Ashley (Sydney Sweeney) loses her mother young and in her desperation to reconnect the motherly bond she accidently invites a demon into her body leaving her family searching for ways to save her. 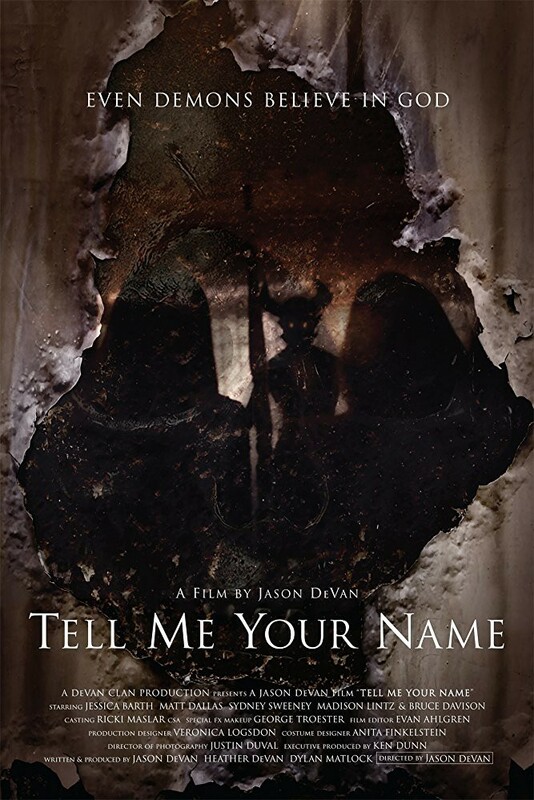 Scheduled to come out in May "Tell Me Your Name" is directed by Jason DeVan in his debut film. I’m not sure how I feel about this one. The small glimpses of the demon we see, a shadow monster with red eyes, does nothing for me. That could have been the way they cut the trailer, but it felt a little “Goosebumps'y” for this guy. Then again, I rather liked the scene with her gyrating down the aisle muttering under her breath to a stunned preacher waiting at the dais. It doesn’t help that just yesterday I reviewed an exorcist documentary I can’t wait to see by William Friedkin “The Devil and Father Amorth.” So maybe I’m biased here. “Tell Me Your Name” could be a lot of fun but I’m reluctant to get excited. Yeah it’s a trailer, I’ll calm down. And a little shout out to “The Autopsy of Jane Doe” which completely surprised me a few years ago, taking demonic possession on in a unique way in a film that I recommend. Let’s hope I’m wrong here and we can get two fun dark (fiction and non-fiction) exorcist movies here in 2018. The power of Christ compels thee! !